ETA Website Travels A Different Road And Wins Gold! SEATTLE (Nov. 3, 2016) – Event Transportation Associates (ETA), a full service event transportation company, announced today that the company’s newly redesigned website was recognized with a Gold award from the 2016 MarCom Awards. The ETA blog, In The Driver’s Seat, won an Honorable Mention from the Association of Marketing and Communication Professionals (AMCP), one of the oldest, largest, and most prestigious competitions in the world. ETA was honored to win a MarCom 2016 Award for its newly lauched website. 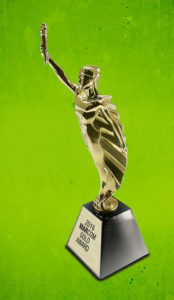 The AMCP, an international organization that consists of several thousand creative professionals, administers the MarCom Awards, which recognize outstanding achievement by creative professionals involved in the concept, direction, design, and production of marketing and communication materials and programs. Judges for the 2016 MarCom Awards reviewed more than 6,000 entries, looking for companies and individuals that exceeded a high standard of excellence and whose work serves as a benchmark for the industry. The 2016 MarCom Awards boasted 280 areas covered broadly by four categories. Both of ETA’s awards were in digital media. ETA, founded in 1991, provides full service event transportation services and specializes in the design, planning, and management of world-class, highly visible and complex major special events. The company also offers VIP transfers, airport meet-and-greets, and shuttling. Services range from transportation design, planning, management, and vehicle logistics, to professional traffic engineering services, including event routing and emergency route planning. Known for innovative solutions that are environmentally friendly, ETA is headquartered in the Greater Seattle area with offices in Denver, Los Angeles, Orlando, and Phoenix. www.ETA-main.com.